Ever since my first run on the Bethpage bike trail five years ago, I've always envied those who lived near the path. How great would it be to run across the street or through your backyard onto a protected trail that runs from Bethpage State Park to the start of the Massepequa Preserve? Pretty great I thought. I knew of the Greenbelt trail north of Bethpage that runs in various forms all the way to Cold Spring Harbor. But up until recently, that was mostly dirt paths with separations between sections. Now that the Greenbelt has been paved all the way to Woodbury Road, I've been running parts of it from the north and other parts from the south, starting at Bethpage State Park. My dream of running from my house to Bethpage was getting closer to reality, but I had never run the full distance. That is, until today. My friend KWL is a great runner and triathlete who finishes half marathons in 100 minutes and rides Gran Fondos, sometimes within days of each other. He and I have done many runs together, and once we mountain biked at Stillwell and followed that with a long trail run. KWL loves hills, and though I don't, I couldn't help suggesting that we run the full length of the northern Greenbelt from Bethpage to my house. This morning we drove to Bethpage and parked my car in the lot before getting on the bike trail north. We kept a moderate pace, because it was hot, humid and we knew there would be hills. To his credit, KWL never complained about running so easy. I tried to make a case for the benefits of LSD and he accepted it. KWL is participating in a Ragner Relay at the end of the week. This race is the first Ragner staged in Canada and it goes from Cobourg to Niagara Ontario, A total of 192 miles. Each team has 12 runners who run three legs each. A few years ago, Adventure Girl captained a Ragner team that ran the Woodstock to Bronx course and I remember the details, logistics and team management that went into that. Not to mention the fact that everyone ran about 20 miles, throughout the day and night. KWL won't need to worry about all of that, but he'll be doing all that running. Our run today took us past the spot where I'd previously turned back toward Bethpage. There was almost another mile of running before we would reach my southern turnaround point from last Saturday. I was excited to have traveled every foot of the paved Greenbelt, but I also knew we were now at the foot of the first of three sizable hills. With nothing to do but face the challenge, we made our way either uphill or down for the next three miles. By this time the heat and the hills were starting to get to me, but I wasn't looking for an excuse to stop. Once we'd passed the third hill I knew it was mostly down or flat the rest of the way. We reached Woodbury Road, the end of the line. Not for our run, but it was the end of the paved bike trail. We proceeded to cross the street and run through the local neighborhood before exiting at the middle school and making our way to my driveway. According to Garmin, we'd covered 6.6 miles with a total elevation gain of 440 feet. It sure felt higher than that. We cooled off and drove back to Bethpage to get my car. Along the way, we noted the ground we were covering and the fact that we'd just ran that entire distance. I'm looking forward a shorter and (hopefully) easier run tomorrow. 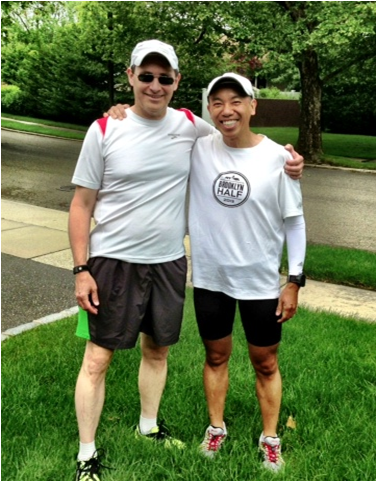 I finally got the chance to run all the way home from Bethpage, and I was fortunate to do it with great company. You are on FIRE! Congrats on a great run! It was great, but a bigger effort than I'd expected. I was never so happy to see my house at the end! Sounds like a great run! Congrats! I hope to make it that far north one of these days. It's definitely worth running the northern end, especially if you want a hill challenge. If you get on in Massepequa and run it top to bottom, you can cover about 25 miles. I wore my Brooklyn half shirt for my run yesterday too :) I still have yet to get on that path!!! I was jealous of his shirt, but then again, I haven't run Brooklyn yet. I definitely recommend the Greenbelt!